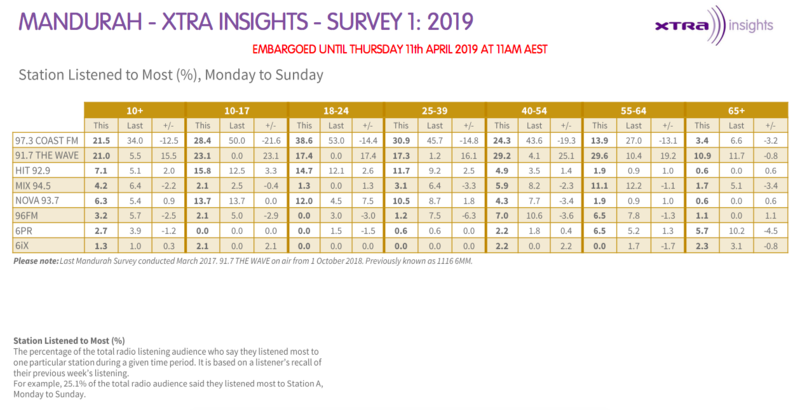 97.3 Coast FM is Mandurah’s top radio station, just clinching the title over rivals 91.7 The Wave in the latest Xtra Insights regional radio ratings. It’s the first survey since March 2017 in the Western Australian region of Mandurah. Coast FM was the station listened to most by 21.5% (-12.5) of People 10+ in the region, just ahead of The Wave which rose to 21% (15.5%). Both local stations performed better than Perth stations accessible in the area. Hit, Nova & Mix 94.5 came in 3rd, 4th and 5th respectively. Coast FM was marginally ahead of The Wave in the Breakfast ratings as well, with Nikki & de Mello winning over Gunner & Ali who moved to The Wave in September last year. Wow! Well done to The Wave! Awesome results. Last survey ( 2017), they were 6MM, and their numbers couldn’t have been much lower. Now they are just about in the lead even over Coast FM. 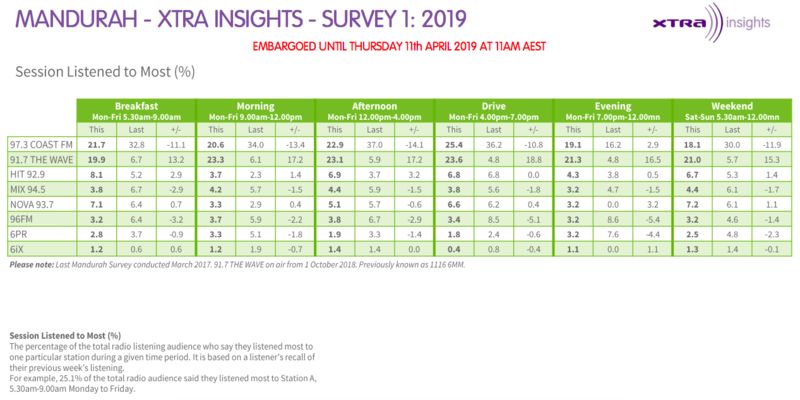 Massive improvements, and good decision changing the station name and announcers in September 2018. Well done Coast FM & The Wave!